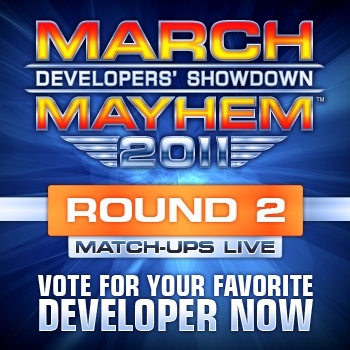 March Mayhem's second round has begun! To catch up on the first round's results, check out these highlights. March Mayhem: Developers' Showdown continues to amaze the gaming community as the first round finishes up with great wins and amazing upsets. Round 2 will also has key match-ups that you will want to watch carefully. There is some strong competition this year for the number 1 seed as Blizzard, BioWare and Valve all received tons of votes and are favored to sweep their divisions. However, they have the 2nd seeded developers to worry about still as Bethesda, Capcom and Rockstar North dealt with their opponents handily and are not looking to go home early. Within the higher seeded brackets is newcomer Game Freak, creators of the Pokemon games, sending veteran CD Projekt packing to wait for another year. In the North Division, Treyarch and PopCap were neck and neck most of the round but Treyarch took the slight lead early and kept it for the win. There were some great round 1 upsets but the biggest was 16th seeded wildcard Mojang AB, creators of Minecraft, taking down gaming industry juggernaut Nintendo in a pitched battle. Does this Cinderella have what it takes to make it all the way and potentially knock out other tournament favorites? Only time and votes will tell but keep an eye on their next match-up again Namco Bandai in the West Division. Also creating a wave of excitement was 15th seeded Cryptic knocking out last year's developer killer, Zygna! The Zynga fans hung in there through the end but didn't seem to have the support of the rest of the community this year as Cryptic and their multiple online communities get ready to take on Naughty Dog in the North Division. 9th seeded Crytek (Crysis) took down 8th seeded SCE Santa Monica and the God of War community. 10th seeded Rockstar San Diego, developers of Red Dead Redemption send home 7th seeded BioShock 2 deveolpers 2K Marin. 10th seeded Remedy sends Epic Mickey and 7th seeded Disney Interactive back to the magic castle for some dancing time with the Mouseketeers. Two-time March Mayhem champ and 6th seeded Turbine gets ousted early by the Dead Space crew over at 11th seeded Visceral Games. Round 2 has begun, so head over to the Official Bracket to begin voting. Welcome to the Mayhem!